"THE horror tome! Every DVD collector and/or horror aficionado cannot do without this book. Period. From 1980-1989, almost every film is covered alphabetically within year of release." "...Even if you don't agree with the final judgement Muir lays on a particular film, you can not deny he writes well on the subject. This author is a fan who operates bi-laterally as a critic and historian. Anyone who cries fowl of a "missing" film is "missing" the point of this reference guide. It is almost impossible to list or actually see every horror film! I can't imagine what Muir went through for this book...To sum up, if you think you could do better, please bestow unto us that gift. 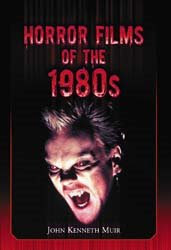 John Kenneth Muir's Horror Films of the 1980's is a must buy..."
Let's face it: Muir knows his stuff! And while there is no shortage of genre film "critics", what separates Muir's work from others is the fact that he writes well. Funny notion, huh. He ACTUALLY knows the english language and uses it in an educated manner via the written word. Wanna-be writers on the subject should take a look at the published material of J.K.M. to see how it's done! Glad you like my blog...More Muir book reviews to come on CINE AUTOPSIS in the future. Wow!!! Thanks J. Thomas. I appreciate your words so much. You're not slouch in the words department, yourself! Congratulations on a great blog! I added a link to your site on the blog here. Your blog is great. I love your piece on Eaten Alive.